The average price for this game in the past 6 months is $12.53. The game first became 50% off on Jan 27, 2017 at Green Man Gaming. Lowest historic price was $11.70 on Jan 31, 2019 at Green Man Gaming. For those who still don't have BioShock, the collection is on sale for $12.27 at GMG. Includes BioShock, BioShock 2, BioShock Infinite, and all single player DLC for the three games. BioShock: The Collection returns to the under $14 price range thanks to a weekend flash sale at WinGameStore. Deal ends later tonight. Steam key. BioShock: The Collection down to $14 today only at the WinGameStore. Beats the now expired Steam Summer Sale price of $15. Do you remember a few months ago when the BioShock Collection was a $60 purchase? New low today at the WinGameStore for $14.24 after coupon. This is its historic low price and 76% off the still $60 it goes for on Steam right now. Includes BioShock 1&2 remastered, BioShock Infinite + Season Pass and all other minor DLC for all games. New low on the BioShock: The Collection at GMG today with a drop to $16. Cheapest ever by $15. Includes BioShock, BioShock 2, BioShock Infinite, and all single player DLC for the three games. The average price for this game in the past 6 months is $15.00. The game first became 50% off on Feb 13, 2017 at GameStop. Lowest historic price was $14.99 on Feb 23, 2019 at GameStop. Bioshock: The Collection Xbox One Download Code down to $29 at NewEgg after coupon + instant savings. Historic low for the September 2016 release which gets you everything BioShock in one fell swoop. Best Buy has BioShock The Collection on sale for the PS4 and Xbox One at only $35 a pop - this translates to $28 with GCU membership. Store pick available. The average price for this game in the past 6 months is $14.99. The game first became 50% off on Feb 13, 2017 at GameStop. Lowest historic price was $14.99 on Dec 1, 2018 at PlayStation Store. Bioshock: The Collection didn't see much action in yesterday's Prime Day but today it is on sale at Amazon for a mere twenty bucks. New low by $5 for the remastered collection of BioShock, BioShock 2, BioShock Infinite, and all DLC for all the games. Best Buy has both the PS4 and Xbox One copies of BioShock The Collection on tap for $25. With GCU this brings the game down further to $20. Store pick-up available. Bioshock the Collection on PS4 and Xbox One drops to $25 this week at Walmart. This makes the lowest price we've seen by $5. Amazon decided to price match but elsewhere the game is the full $60 list price. Bioshock the Collection on PS4 and Xbox One drops to $30 this week at Best Buy. 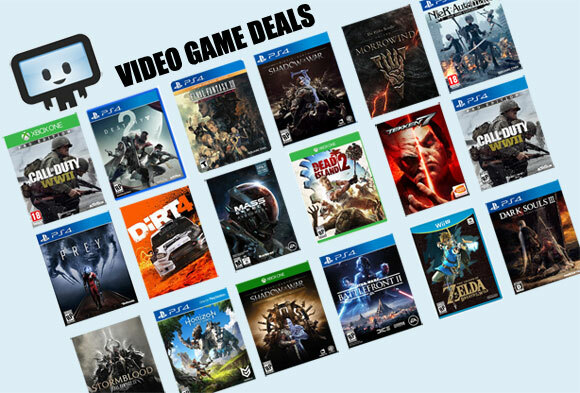 Gamers Club Unlocked members gets an additional 20% off which cuts price down further to $24. The BioShock Collection on Xbox One and PS4 ties its historic low of $30 this week at GameStop. A $60 purchase for the September 2016 release which only finally started getting good price drops this year. The average price for this game in the past 6 months is $5.96. The game first became 50% off on Jun 7, 2013 at GameFly. Lowest historic price was $3.82 on May 11, 2015 at Green Man Gaming. You can't go wrong with $6 BioShock Infinite at Fanatical. It's not lowest ever, but its close. Steamplay title that works on PC/Mac. Price is good for 48 hours. BioShock Infinite down to a mere six bucks at GMG after coupon. Deal began yesterday and will only be good for 48 hours. Mac Game Store has Bioshock Infinite on PC for only $7.49, today only. Not the lowest price we've seen ever on this game but this is the lowest online at the moment. New low on BioShock Infinite. Today GMG dropped the price 75% instantly AND has a stacking 20% off coupon getting the game down to six bucks, or the lowest price ever by $1.50. Elsewhere you'll pay the full $30 MSRP. 2013's top game for only $8. Why not? If you missed the previous deals on BioShock Infinite, $8 is a good admission price. The average price for this game in the past 6 months is $8.02. The game first became 50% off on Apr 18, 2014 at GetGames. Lowest historic price was $4 on Jun 17, 2016 at Green Man Gaming. The BioShock Infinite: Season Pass cut to only $4 in an 80% discount at GMG. Previous low was the Steam Summer Sale last month for $5. BioShock Infinite: Season Pass now under five bucks at the Mac Game Store. Ties its all time low last seen in January of this year. Normally a $20 purchase. A similar 76% discount also available on the base game BioShock Infinite. BioShock Infinite Season Pass is now only $4.74, matching previous lowest price. This is a Steam Play key that will work on PC/Mac copies of BioShock Infinite on Steam without an issue. The base game is also on sale for about $7 for those that still haven't give Infinite a try. BioShock Infinite Season Pass is only $6 at GameAgent. It includes four DLC packs. Steam Store has next best at $10, but elsewhere it's $20. Awesome price on BioShock Infinite Season Pass from Mac Game Store. Steam key so confirmed to work on PC too. The last time the Season Pass was on sale it was a month ago, usually around $24. Solid deal to complete your Bioshock Infinite experience. The average price for this game in the past 6 months is $6.59. The game first became 50% off on Sep 19, 2010 at GoGamer. Lowest historic price was $3.29 on Jul 28, 2016 at Green Man Gaming. If you've never played BioShock 2 because you're a super pansy like me and you're scared of horror games, then you're in luck because Green Man Gaming has the game for $5 for the next few days. Not a super duper deal or anything but still cheaper than usual price of around $6 to $7. The average price for this game in the past 6 months is $6.59. The game first became 50% off on Nov 27, 2012 at Green Man Gaming. Lowest historic price was $2.25 on May 11, 2015 at Green Man Gaming. WinGameStore is running a big 2K/Rockstar sale with plenty of goodies, including BioShock 1 and 2 on sale for up to 76% off. This gets you upgraded to the Remastered version without spending the big bucks on the BioShock Collection. Nothing beats a free game. If you've never play the dystopia horror FPS great that is BioShock, you can get the digital PC download version for free from GameFly.